Chelsea are behind Liverpool and Manchester City for precisely two reasons – Alvaro Morata and Olivier Giroud, according to former Arsenal defender and pundit Martin Keown. 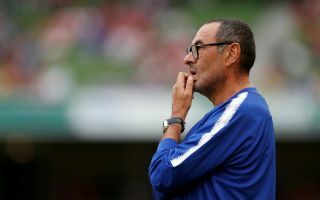 New Chelsea manager Maurizio Sarri has rotated between the two this season, but neither are scoring nearly enough for a side with genuine title ambitions. Morata has notably struggled since his big move from Real Madrid last summer, scoring just 16 goals in 56 games for the Blues. Giroud, meanwhile, joined from Arsenal in January and looks decent as a backup at centre-forward due to his link-up play and strength at holding the ball up, but he’s never been a particularly prolific scorer either. Chelsea have had to rely on the magic of Eden Hazard to contribute their goals so far this season, and Keown feels this may ultimately be the biggest problem for CFC in terms of competing with Liverpool and City this season, both of whom look more complete in all areas and who’ve made great starts as well. ‘The critical thing for Chelsea is their two centre forwards are not scoring. That is a real worry,’ Keown told the Mail. The more time goes on, the more loaning out Michy Batshuayi might look to be one big mistake by Sarri this season, with that leaving him with only Morata and Giroud to choose from for at least half the campaign if they perhaps recruit a new signing in that position in January.